Those estimable missionaries of the Nederlandse Bachvereniging have reached the book of Matthew in their quest to record the complete JS Bach on video. The performers are the Netherlands Bach Society and the Kampen Boys Choir, conductor Jos van Veldhoven. Click here for full performance. That’s one of the cases where the grossly overused expression “amazing” is truly relevant. The Netherlands Bach Society under van Velhoven are the real deal. 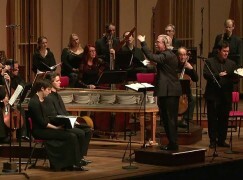 http://allofbach.com/en/ is arguably one of the very best webpages with classical music. One of the most amazing classical music websites ! Not only can one look forward to all of Bach’s music ( and so far the available performances have been outstanding ), but each work comes with interviews and introductory articles. The filming is in HD quality with excellent camerawork. For all to those who haven’t been there yet : go now, check it out and get your weekly dose of Bach , as every Friday a new work is added. I had never heard of this site till seeing this thread. Decided to have a quick look at the start of the St. Matthew Passion last night at 1:15 am and just could not stop listening and watching. Quite marvellous! I have bookmarked the site and will be a regular visitor. Thank you NL. Sharing Bach with the world. Compare this to pay wall of the Berlin Philharmoniker…. And personally, in the St. Matthew Passion – in any Bach, really – I’d choose the Netherlands Bach Society over the Berlin Philharmonic.